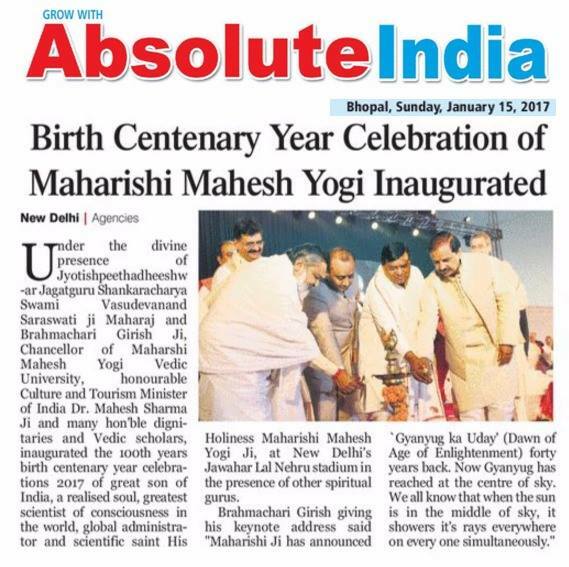 100 Conferences on Celebration of Perfection in Life "Life is Bliss"
Year 2017-18 was the Birth Centenary Year of His Holiness Maharishi Mahesh Yogi Ji. It won’t be exaggerating to say that right from his childhood till the heavenly abode and 10 years after the departure of Maharishi Ji, these 100 years have been very important for the time cycle-for world history. 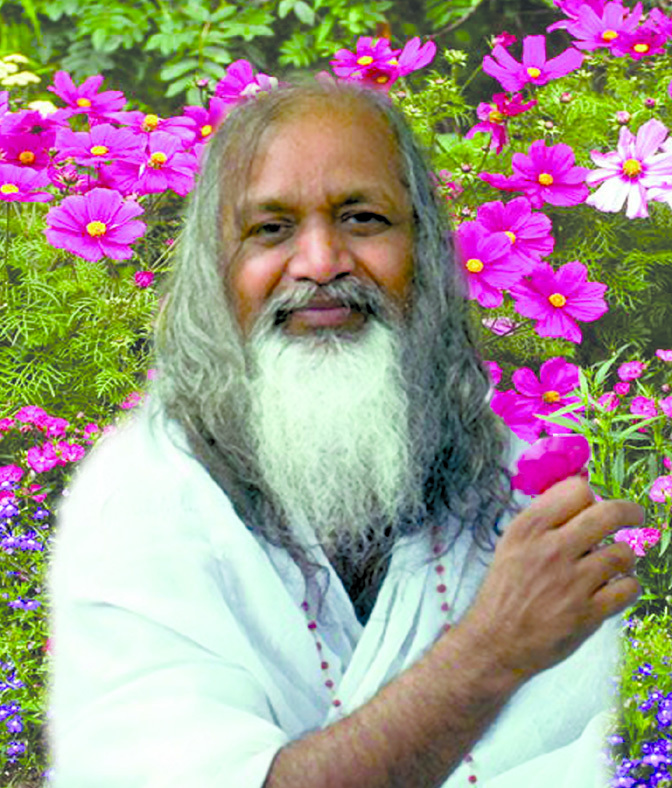 Born on 12th January 1917 in Panduka village of Raipur in Madhya Pradesh (now capital of Chhattisgarh State), His Holiness Maharishi Mahesh Yogi Ji, the most dedicated disciple to Shri Guru Dev Swami Brahmanand Saraswati Ji, Shankaracharya of Jyotirpeeth, Badrikashram Himalaya, is widely regarded as the foremost scientist in the field of consciousness and is considered the greatest teacher in the world today. Over fifty five years ago Maharishi Ji’s infinite love drew him out of isolation in the Himalayas to relieve the world from suffering, to provide people joy and peace and to create Heaven on Earth. Having learnt from his Guru Dev, Maharishi Ji completely revived and restored, ancient Vedic Science that is capable of creating perfect life and guiding individuals to the path of Enlightenment. Maharishi Ji has completely restored the thousands of years old scattered Vedic Literature for the total significance of its theory and practice and has organized it in the form of a complete science of consciousness. Maharishi’s Vedic Science and Technology unfolds the full potential of Natural Law in human consciousness as the basis of improving all areas of life. The Transcendental Meditation programme, the subjective technology of Maharishi’s Vedic Science and Technology is the most widely practiced and extensively researched programme of selfdevelopment in the world. Over the past forty-seven years, Maharishi Ji has established a worldwide movement in more than 100 countries offering the knowledge and practical programmes of Maharishi Vedic Science in all areas of life. Maharishi Ji never called himself a Guru or never asked any one to address him a Guru. Throughout his life Maharishi Ji was saying ‘Jai Guru Dev, All Glory to Shri Gurudev Swami Brahmanand Saraswati Ji’ and dedicated all his achievements in the lotus feet of his Master. The whole world has honoured Maharishi Ji as greatest teacher of Vedic Science and a historic Vedic Jagadguru. 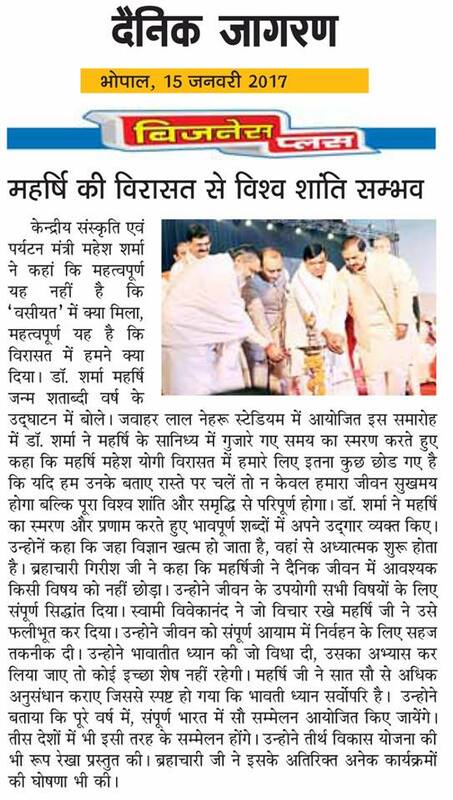 Maharishi Ji has made a very significant place in Vedic Holy Tradition. No such other example of spiritual exponent is available in the world. 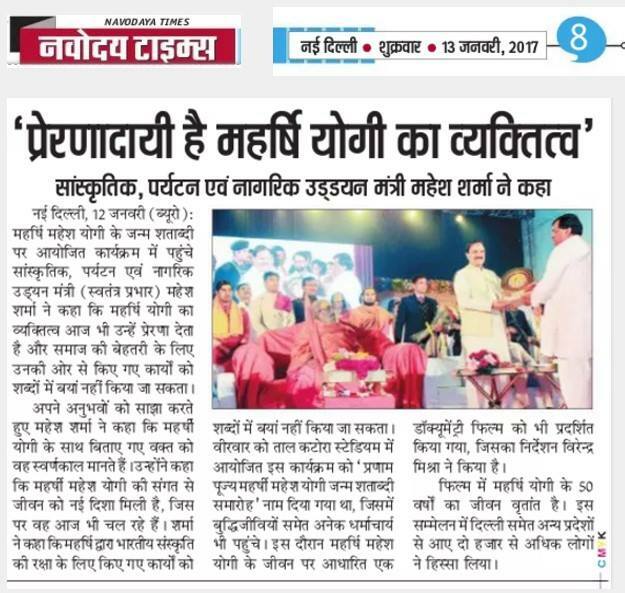 This gives us great pleasure and satisfaction that eminent citizens of all walks life attendant these conferences and received the eternal knowledge imparted by His Holiness Maharishi Ji with great enthusiasm. This indeed is great pleasure for us that this book which is a pictorious report of the conferences took place country wide, is being released for the information and joy of all. 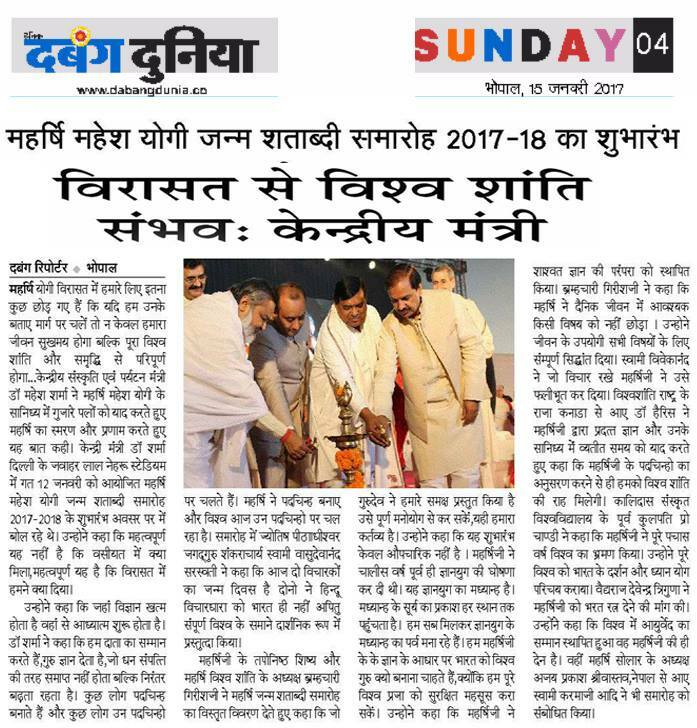 Brahmachari Girish Ji announced many programmes to be organised country wide and in 30 other countries in 2017–18 by Maharishi Organisations. Also 100 conferences all over India on the subject “ Perfection in life” and Yagyanushthan will be organised in all main centres of pilgrimage-Teerth with the sankalpa of peace, prosperity, perfect health, enlightenment for all citizens and invincibility to all nations. 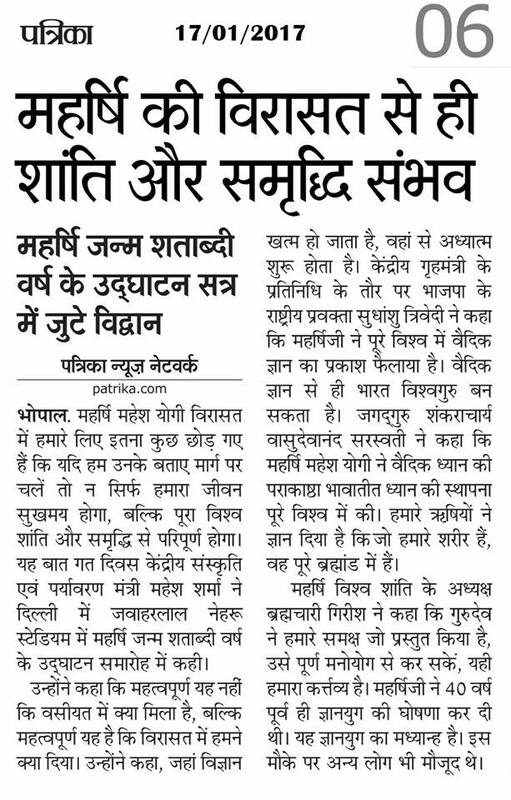 1000 camps for Yog and Transcendental Meditation will also be organized. Raja Harris Kaplan, the Raja representative of Maharishi Global Country of World Peace for India said “We are here to celebrate the Birth Centenary of Maharishi Ji, who gave the knowledge to live in accordance with laws of nature”. 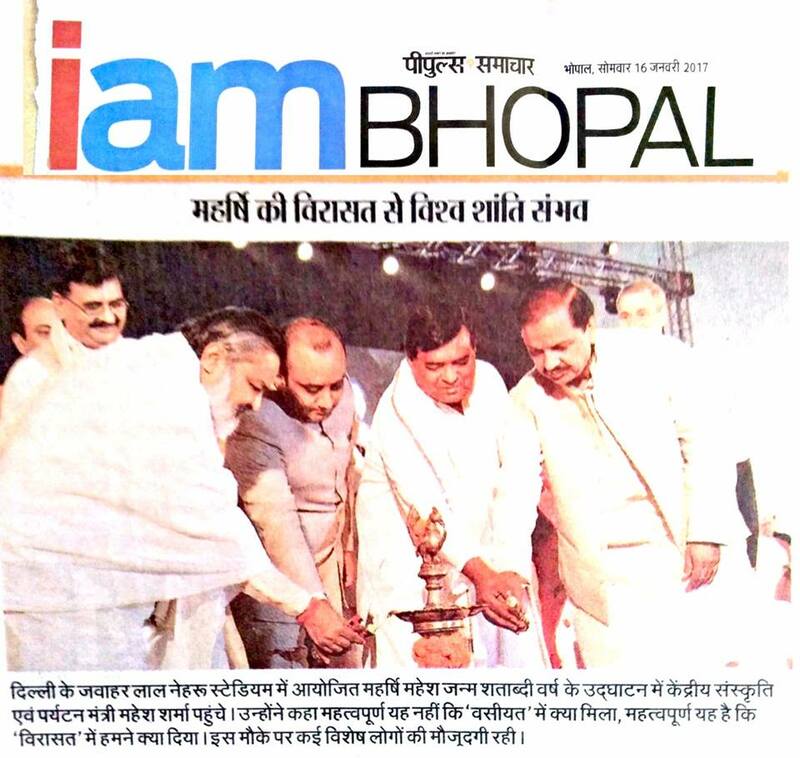 National Spokesperson of Bhartiya Janta Party Shri Sudhanshu Trivedi also graced the event with his presence. He said, “I am feeling really proud to be part of this auspicious occasion. Guru Ji has given us the way to meditate in a scientific way”. Another student from Hyderabad said, “Transcendental Meditation gives us inner strength to feel good and light when we are in grim situations. TM makes us so relaxed and strong that we are able to face any kind of problem”. 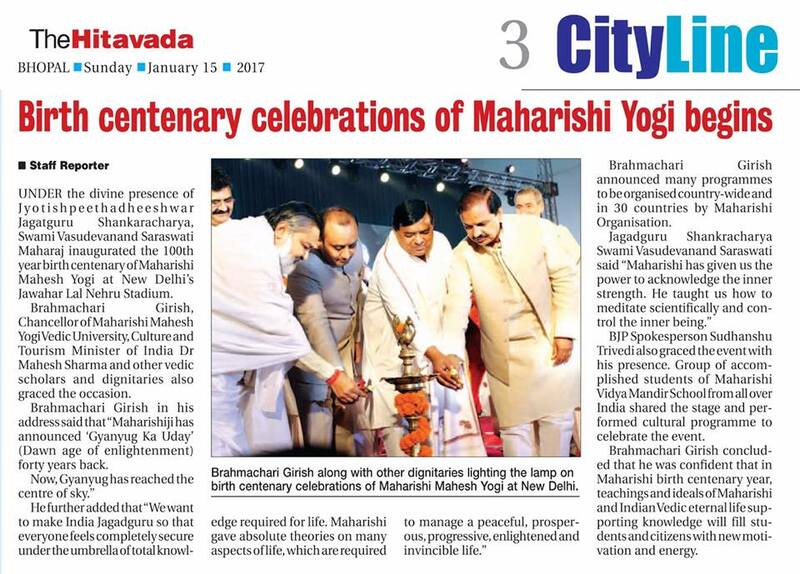 Brahmachari Girish Ji concluded that he was confident that in the Maharishi Birth Centenary Year, the teachings and ideals of Maharishi Ji and Indian Vedic eternal life supporting knowledge will enthuse the students and all other citizens of great country-India with new motivation and energy. With this knowledge, people will be able to choose the right path in their life and by following Maharishi Ji’s ideal that ‘Life is Bliss’, all will strive to translate the vision “Heaven on Earth” of Maharishi Ji, into reality. On this auspicious occasion beautiful and unique Maharishi wall and table calendar of 2017, Diary of 2017, beautiful book on His Holiness Maharishi Mahesh Yogi Ji were released by all present dignitaries.